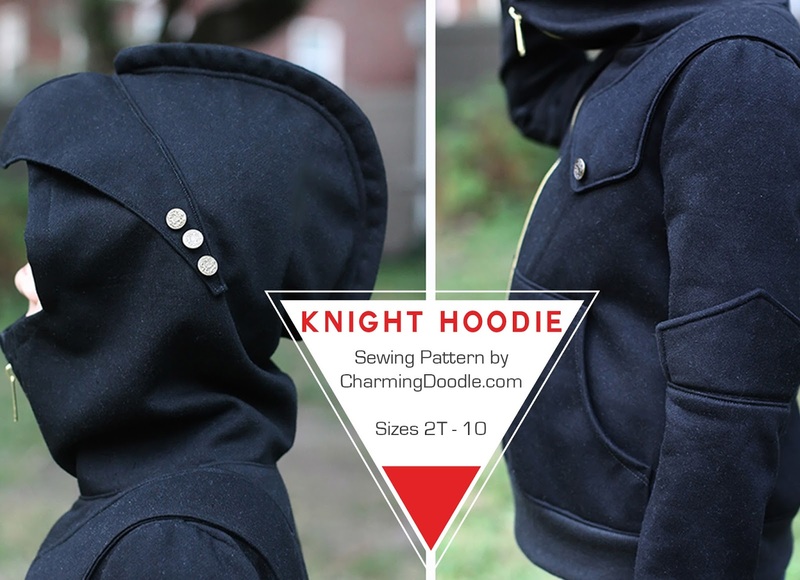 Make It Handmade: Knight Hoodie Coupon and Giveaway! Knight Hoodie Coupon and Giveaway! I'm thrilled to be talking about the Knight Hoodie today-- and I have a special coupon code for each and everyone of you! (So much better than a giveaway!) Scroll down to the bottom for the code! Although I knew I wouldn't have time to sew one up, I asked (begged) Elisa If I could review a copy anyways. Her patterns are so gorgeous they read just like a magazine. I couldn't wait to get my hands on it! This pattern does not disappoint. It is an absolute joy to read through-- you can get a feel of the style and feel of the pattern by looking at her sizing chart here. I know the sweatshirt looks complicated, and I was impressed to see that Elizabeth has instructions for each and every element so it looks professionally finished. I really think if you've done any garment sewing at all you'll be able to make a gorgeous hoodie with her instructions. She's generously offered a coupon for all MIH readers-- $2 dollars off when you use the coupon "Handmade". You can also enter the giveaway below to win a copy!